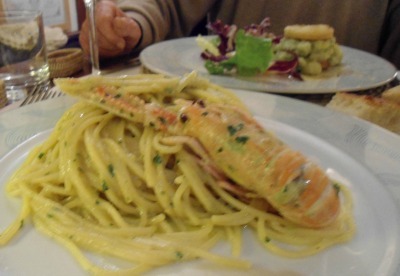 Off the beaten path Florence restaurants are for people who want a truly authentic local dining experience. 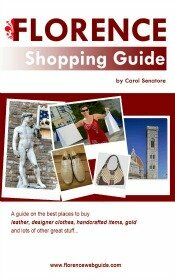 These highly recommended places are not in areas where vacationers usually go in Florence. That means you’ll probably be the only forestiere (non-local) in the place! Imagine the fun of enjoying a delicious meal hearing only Italian chatter around you and being able to practice your Italian with a server who probably never has to speak English at work. I’ve put together a list of great insider tips about off the beaten path Florence restaurants where I guarantee you will find a genuine Florentine atmosphere and a meal that won’t disappoint. And if you’re worried about time, you shouldn’t be. Off the beaten path restaurants aren’t necessarily very far from the downtown area. After all, Florence isn’t Paris - it doesn’t take long to get anywhere really. Most OTBP restaurants can be reached within 15-20 minutes from downtown. So, if you’re the adventurous type, go for it! 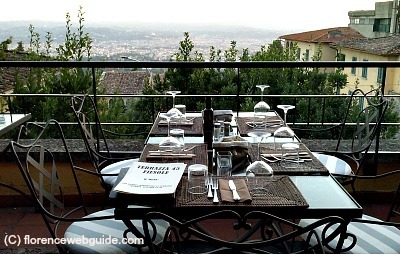 This off the beaten path Florence restaurant is in Fiesole, the Etruscan town located in the hills just over the city, a mere 10 minutes away. If you're looking for a romantic place to dine Terrazza45 is one of the best and highly recommended - just check out this picture and decide for yourself. It's not clear in the image, but from this rooftop terrace there is a view right onto the Florence Duomo and all of the city center, stunning! The atmosphere is laid back and peaceful and candles are lit at night to enhance the mood. And the food? Very good: classic dishes (Tuscan meats, bistecca, homemade pastas) and some avant-garde recipes too for the more daring diners. You'll find a few foreign influences on the menu too, like huge burgers and warm apple crumble! 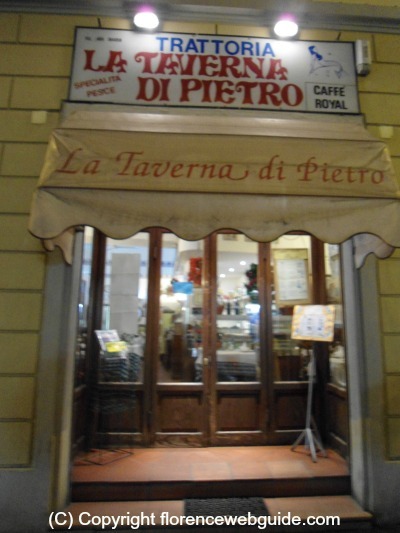 La Taverna di Pietro is a local fish restaurant whose prices can’t be beat. 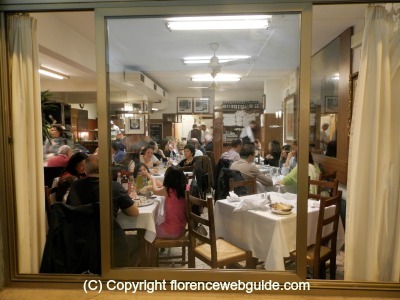 Just 10 minutes from the downtown ‘Porta al Prato’ old city gate, this Florence fish restaurant was already known for its great value when I moved here in 1990. They pretty much always have the same main fish lovers’ dishes: spaghetti with shell fish in a tomato sauce or seafood risotto (both are extremely tasty and I never know which to choose). Then there’s a mixed seafood platter that can be either grilled or fried (or a bit of both). And a few other classics like roasted fish, steamed mussels in lemon sauce or grilled jumbo shrimp. A full meal goes for €25 a head. This includes a hot & cold seafood appetizer, a pasta combo with 3 types of 'primo', then a mixed seafood platter, French fries, house wine, water, bread and espresso. A 'mini' meal goes for €15 a head and includes a 'primo' (pasta or risotto), mixed seafood platter, French fries, house wine, bread, water and espresso. The restaurant is definitely no-frills. It’s a very simple place, no waiters in coat and tails if you know what I mean….but that’s part of the charm. There’s no formal bill, Pietro just tells you what you owe and you pay in cash (no plastic accepted at all). La Taverna di Pietro is a real locals’ locale, it’s always reliably the same – you eat well and spend a little. short taxi ride from station (5 mins) or one of several buses: no. 17 (direction ‘Boito’ or ‘Cascine’) or any of buses no. 29 , 30, or 35 all of which you can catch in via Alamanni on the tram side of the station. Get off the bus at the ‘via Toselli’ stop. From the bus stop walk back along via Toselli in the direction you came from to via Lulli (2 corners from the bus stop) and turn right into via Lulli, go one block and turn left. The restaurant is right there at no. 134r in via Ponte alle Mosse. To go back downtown, get bus in via Ponte alle Mosse - come out of restaurant and go right, bus stop is across the street. This is one of my favorite all time restaurants in Florence and is a sort of local institution. I Fratelli Briganti has been around forever, a family-run business from one generation to the next. They have all the classic Florence foods like bistecca fiorentina and ribollita and also crispy pizzas cooked in a wood-fired oven. 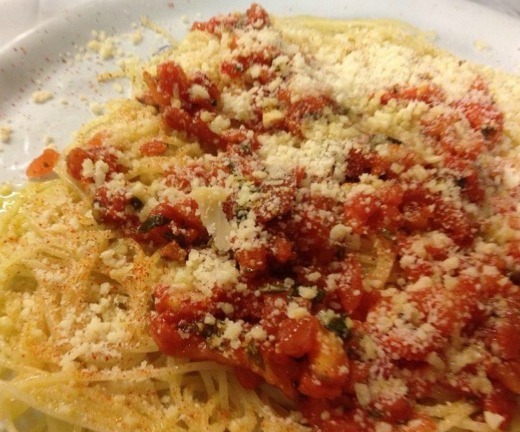 Briganti has a special 'signature dish': thin spaghetti with diced tomatoes, olive oil, garlic (lots of it!) and tons of parmesan cheese, all served in a huge portion on a big flat platter. People come from all over to eat these 'spaghettini'! 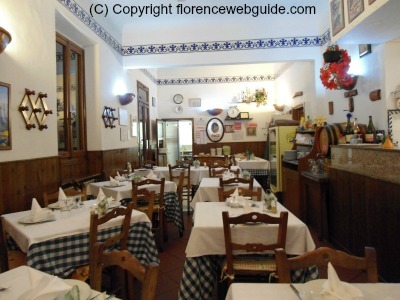 This off the beaten path Florence trattoria also has an outdoor patio that is open most of the year for eating outside. The atmosphere at Briganti is just as great as the food: super friendly, warm, fun, easy-going, and full of regular customers (and often local celebrities). I definitely recommend booking a table here especially on weekends. How to get there: short taxi ride from station or bus no. 28 (direction 'Volpaia') to 'piazza Pietro Leopoldo' stop. 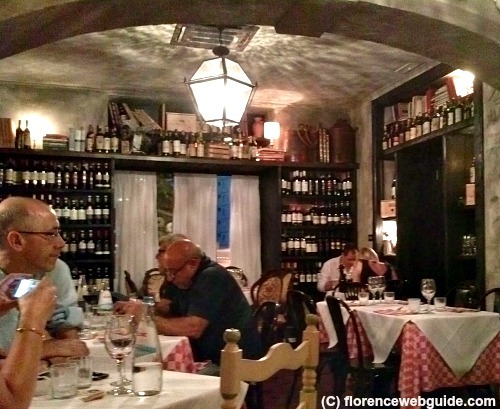 If you happen to be in the part of Florence called 'Novoli' (an area that most tourists definitely do not visit), the Osteria di Poneta is a new locale that is winning hearts right and left. Novoli is not a pretty part of Florence: large office blocks, wide busy streets, construction going on, the road to the highway passing through....you get the idea. Which is why the owners of this great off the beaten path restaurant decided to open here, to bring some old-style Florentine traditions to the neighborhood. And the locals are loving it! The restaurant has a rustic vintage interior, very particular and original. The service is super friendly and helpful in choosing the best dishes of the day and the menu is typical Tuscan fare at its best with meat and hand-made pasta specialities. Oh, and since it's not in the super expensive downtown area, it's way cheaper than your traditional osteria in the center of the city too! The name of this Florence pizza place comes from the type of flour used to make pizza dough, '00' flour, the most finely ground. 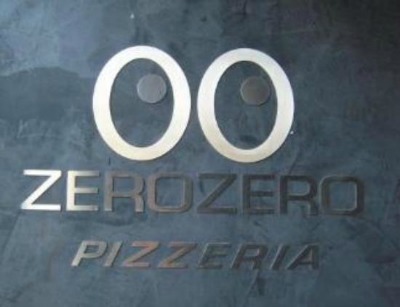 No pizza place in Florence is like Zero Zero because this pizzeria is ultra-modern and innovative. If you removed the tables it could easily become a dance club. Blue-purple lighting, ceiling spotlights, avant-garde decor, and contemporary interior design (the bathrooms are a must-see) make this a pizzeria in a class of its own. Yummm.......a cross between thick bready Neapolitan and thin crispy Florentine pizza, Zero Zero gets the middle-road just right. Their 'big thing' is the pizza served on a wooden cutting board. 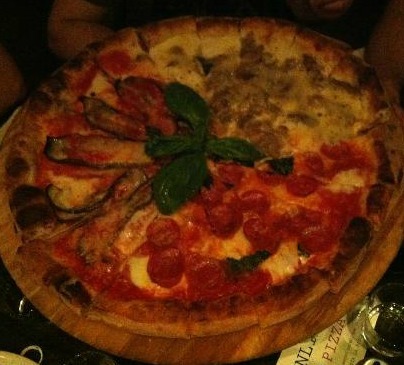 It's a big pizza to be shared and you pick and choose all sorts of toppings, so you could have a part with just pepperoni (called 'salamino' in Italian), another part with sausage, another part with grilled vegetables, and so on. Then it's served to the whole table so each person can have pieces of the different sections with different toppings. The only potential drawback to this Florence pizza place is that it is usually very crowded - especially on weekends - so if you like to dine in a quiet setting it's a no go. You need to book a table, especially on weekends. Tip: Wednesday is 'Ladies Night' - Zero Zero offers 2 glasses of wine to women having dinner. How to get to this off the beaten path pizza place: Zero Zero is just north of the Fortezza da Basso and can be reached on foot if you're a walker. Alternatively, it's a 5 minute taxi ride from the station or can be reached by bus number 2 (direction 'Calenzano') or 14 (direction 'Tolentino' or 'Careggi') to the 'Bonaini' stop. When you get off the bus at 'Bonaini' you have to walk back, there'll be an overpass on your left (you went under it on the bus) and a furniture store 'Mak Mobili' on your right. Turn into the street on right (the bus stop you need to go back is on the left here) and pizza place is in next street on left, via Lorenzoni. Enotria is perfect for the person who would like to try several wines that are specially chosen to match the dishes they are served with. The owners Gilda and Maurizio make it easy for you: the menu has a limited choice of dishes with a wine matched to each dish (served by the glass). The wine cellar has over 750 wines coming from all over the world. This wine bar, cellar and restaurant has been open for over 20 years and has been given the ‘Award of Excellence’ several times by Wine Spectator magazine, most recently in 2010. 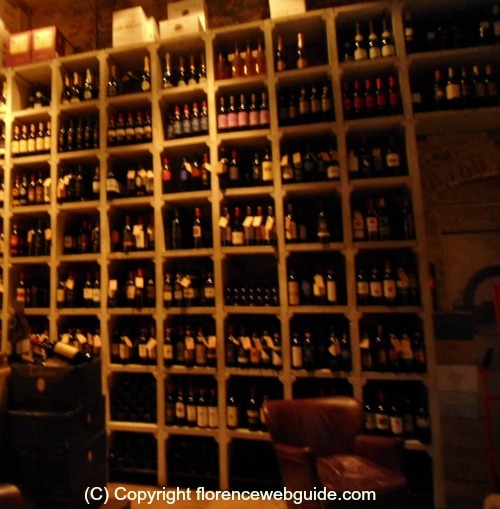 Also, the Florence Wine Society – an association of wine enthusiasts - was founded at Enotria. Prices are moderate: wine by the glass €5, first courses €9 – 15, main courses € 15 – 25. The atmosphere is casual and laid back and the restaurant has a slightly elegant yet still rustic décor. The food is mainly Tuscan cuisine with a lighter touch so hearty dishes such as pappa al pomodoro or minestra di farro, and recipes with porcini mushrooms and cinghiale (wild boar). There are also plenty of parmesan cheese dishes. Ingredients are all seasonal and for the most part locally produced so the menu changes according to what’s in season at the moment. getting to this off the beaten path enoteca is just a 15 minute walk from Porta al Prato or a few minutes bus ride. to walk: from the Porta al Prato stone arch you cross the avenue which puts you at the start of via Ponte alle Mosse – don’t walk into this street but go immediately right one block to get to the parallel street, via Delle Porte Nuove (there’ll be a car showroom on the corner). Go straight down via Delle Porte Nuove to number 50, about 4 blocks. by bus: take bus no. 17 (direction ‘Boito’ or ‘Cascine’) at the station (pharmacy side, the stop near escalators) and get off at the ‘Benedetto Marcello’ stop. Restaurant is right there near the bus stop. To go back downtown, go to via Ponte alle Mosse (a parallel street, cross wide street in front of restaurant at traffic light, go one block to via Ponte alle Mosse – any bus on that street will take you to station). Tullio’s is a country restaurant that serves up some of the best Tuscan food around Florence, and especially the steaks which are top notch. 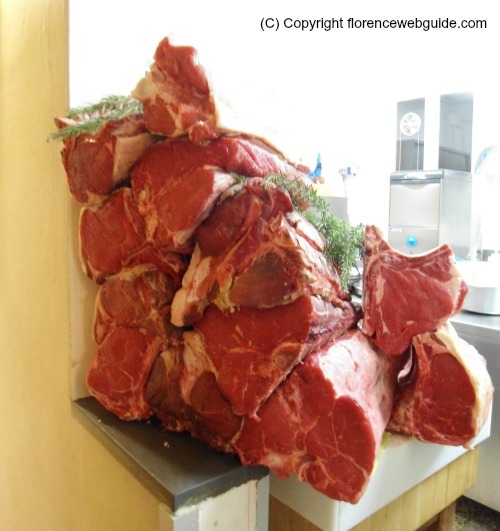 When you walk into the restaurant, in the narrow corridor, you’ll see the kitchen on the right with its huge fireplace for grilling the meat and all the raw steaks ready to be sliced and cooked (not a pretty picture for vegetarians but if you’re a meat lover….fuggedaboutit!). This is a great place to have the traditional bistecca fiorentina. Steaks are for two or more people (as always with the fiorentina) and the waiter brings the meat on a cutting board and slices it up for you. The Fiorentina is a very thick tender and juicy cut of beef grilled on a spit so that the outside is seared and the inside is juicy and quite rare. 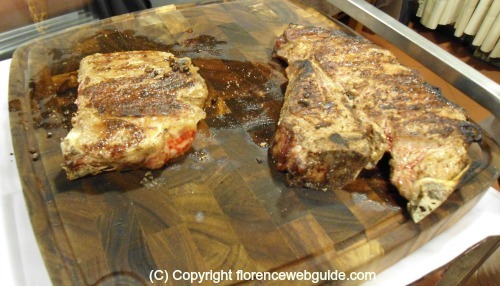 You mustn’t ask for it to be cooked any differently as you would no longer be eating an authentic fiorentina. You have to trust and just try it - add a little fresh olive oil, salt and pepper to your steak and then go for it! Besides the steak, Tullio specializes in Florentine specialities such as ribollita (must try!) and pici (hand made pasta) with meat sauce made of wild boar or hare (again, must try!). The mixed appetizer is a great way to start the meal: Tuscan salami and prosciutto, cheeses served with sweet jam to compliment, fried veggies, olives all’ascolana (stuffed olives dipped in bread crumbs and fried, yum…), and lots of types of crostini (sliced and toasted bread with different spreadings). Tullio is a rustic country style house, with wooden booths and simple furnishings. A part of the restaurant is still a grocery store for the local area (I say ‘still’ because the restaurant actually started out as a shop). 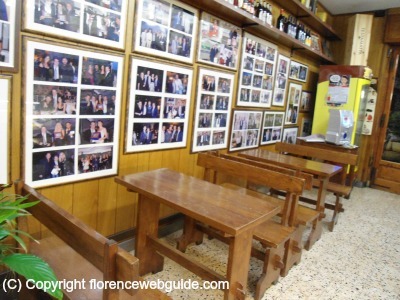 It’s located in the prestigious Settignano area where lots of soccer players on the Florence team live, and in fact there are pictures of famous players and other VIP’s who’ve been to Tullio’s all over the walls in the deli section and in the corridor (have some fun checking them out and see who you can recognize!). Tullio really is off the beaten path though. This is the only off the beaten path restaurant that you need to get to by car. You have two options: go by taxi from Florence (about €35) or go by bus to Fiesole and get a taxi from there which is much closer (under €10). The bus to Fiesole is no. 7 which you get from San Marco square and take to the last stop (looking at the San Marco church, the bus stop is in the street on the right, just off the square). Buses run til after midnight. I don’t recommend you driving yourself even if you have a car in Florence because the road up in the woodsy hills is very dark, narrow and steep so it could be tricky if you’re not familiar with the area. 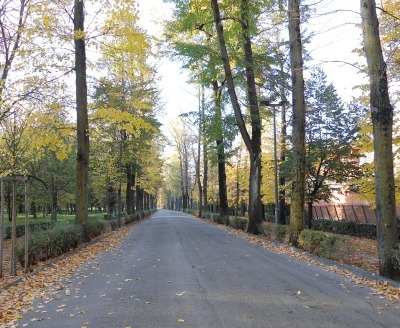 Those wanting to try it (use a GPS system) should drive up to Settignano – not Fiesole – and then head upwards from there, about a 5 minute drive (I repeat, road is dark and narrow – so narrow that only one car fits but it’s not a one way road…).